The Speedmaster XL 145/162 Plattform by Heidelberger Druckmaschinen AG ist the first technology in this format class to be awarded the InterTech Technology Award. Image: Heidelberg. The Speedmaster XL 145/162 platform from Heidelberger Druckmaschinen AG has received the InterTech Technology Award 2013. This is the very first time in the award's history that press technology in this format class has received the coveted award. The judges were particularly impressed with the double gripper technology and motorized paper stretch compensation (remote fan-out control). When printing mixed forms, the larger the paper format, the greater the flexibility in arranging the individual repeats. In the past, large-format perfectors had two limitations to contend with - smearing during sheet travel and machine-related restrictions in the arrangement of the mixed forms, since corridors for the sheet brakes prevented efficient job pooling and reduced the printable area by up to six percent. Both limitations are now history thanks to the double gripper technology that Heidelberg showcased at drupa 2012. Since the sheet in the delivery is guided by grippers at both the front and rear edges, the sheet guide plate has been eliminated completely and, with it, all the risks of ink buildup and associated scratches. Use of a special brake gripper bar also dispenses with the brake corridors that previously hindered job pooling. Jobs can now be nested over the entire surface of the sheet. 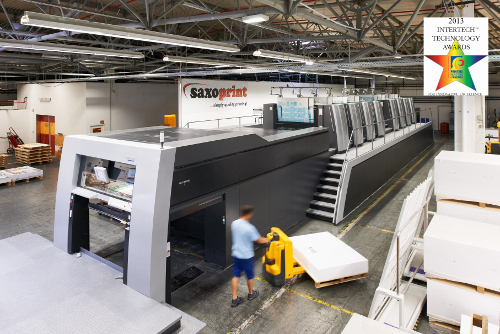 The elimination of brake corridors results in significant cost reduction, not only for web-to-print shops but also for commercial printing. Paper savings of around 5 cm (1.97 in) across the width of the sheet cut paper costs considerably. Heidelberg was the first company in the world to offer motorized paper stretch compensation for large-format applications when it added this function to its Speedmaster XL presses in summer 2012. This technology enables a register error caused by paper distortion at the rear edge of the sheet to be compensated fully automatically from the Prinect Press Center control station. This dispenses with the time-consuming process of manually adjusting the impression cylinder circumferentially or laterally by means of the clamping bar segments. This high register accuracy is a crucial advantage in the production of mixed forms by web-to-print suppliers in particular, as the printer - unlike in conventional commercial printing - has only limited influence over the makeup of the printing form. The mixed forms can easily accommodate up to 100 customer jobs, each of which must be of perfect quality, even if, for example, there are negative 8-point fonts at the rear edge of the sheet in 7B format. What's more, makeready is around ten minutes faster, depending on the machine configuration. Used in combination and depending on the machine and job structure, both functions collectively can achieve annual cost savings of several hundred thousand euros.